Join me on May 4th and 5th from 9- 3 for an epic craft fair in the Maine Coast Mall. Signed Paperbacks will be available! Join me in June 2021 in Nashville, TN for an epic conference of Super- proportions. Join me and a ton of other artisans at the Bangor Inn for a craft fair like no other. Join me in celebrating the release of the conclusion of the Seraphina series. Link to Facebook Party Complete with LIVE reading from Sheena herself! 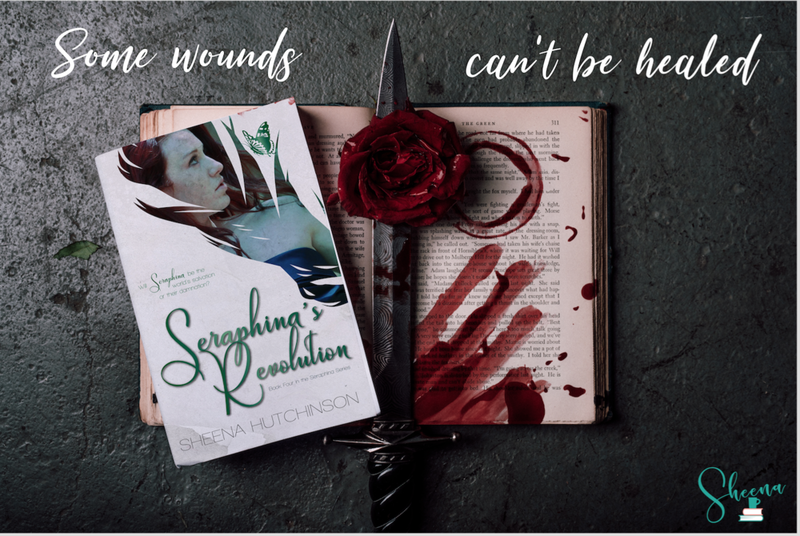 Seraphina's Revolution Cover Reveal & Giveaway! Join me in celebrating the final cover reveal for The Seraphina Series! In honor of Mother's Day and Discovering April's inclusion into the Mother's Day in Hollywood Gift Bags, the kindle edition will be on sale for only $0.99 until Sunday May 13th. The Seraphina Series will of course be on sale too! Don't forget to check that out! Join me for this awesome Blog Hop where each page is hosting their own giveaway! Tons of prizes to win! I'll be in the amazing Smokey Mountains Sept 2017 dreaming up new worlds and characters for one amazing intensive weekend. Hosted by the very own CJ Redwine, author of the Defiance Series. Seraphina's Vengeance is finally here! Join me in finally celebrating the release of the third book in The Seraphina Series with giveaways and much more! In honor of Independence Day ALL my e-books are on sale for only $0.99! Seraphina's Vengeance cover will officially be revealed! With Pre-order link available as well... find out what happens when the line between good and evil is crossed! Seraphina's Initiation release is planned for Early 2017. Join me in celebrating the release of the second book in the series with a blog tour, giveaways and Facebook parties! Book Two in the Seraphina Series!! Pre-order and Goodreads link will be LIVE at that time!! Best part-- Regular Admission is FREE! Join me in celebrating the release of Uncovering Officer Smith May 16th. I will be attending the Unicorn Writers Conference hosted at Manhattanville college. My books will be available on site in the bookstore. Come join us on Saturday, March 21st for Bright Lights, Big Books Presents: Halos and Horns. Seraphina: Initiation is currently live on Amazon! It will be on sale for only $0.99 until 10/27 when it will increase to be included in the Amazon Lending Library! Check out Sera's next leg of her tumultuous journey! Can't make it to the signing? -- No problem! You can still win a ton of cool prizes on my Facebook page! Can't wait to see you all there !! Release Party & Book Signing for Seraphina: Initiation! *Raffle to be drawn for a chance to win a cool prize! Beginning 10/13/14 I will be on tour to promote the release of Initiation 10/20. Join me all over the world wide web to celebrate! Prizes, Excerpts, Interviews, Guest posts, and tons of other fun stuff along the way. Tour stops will be announced closer to the date! Follow along the Virtual Book Tour for Author Interviews, Blogger Reviews and a Ton of Giveaways!